If you need a house to rent in Mayfair in Central London and you Google a term such as “houses to rent in Mayfair” – which is a perfectly reasonable search term – you will find that good old Google comes up with no less than two million results. Unfortunately, when you dig a little bit deeper into the results for houses in Mayfair you will find that most of the properties available to rent are actually flats and apartments, and not houses. There are very few houses indeed, and certainly not many with five bedrooms which is what you might need. This is where Carlton Court can help you. Carlton Court itself is a building containing separate apartments in Down Street in Mayfair, but that is not what you want. We also own a town house, quite literally around the corner in Brick Street, which is a five bedroom house spread over four floors and is centrally located. And if you want to lease it, it is yours. It has a large and airy entrance hall which leads into a large reception room which can be turned into any sort of a room that you wish. If you want to use it as a dining room there is a dumb waiter, and there is also a separate WC. On the first floor is a very large double reception room and an eat-in kitchen with every modern appliance and convenience. Up on the next floor is a master bedroom with a bathroom and shower, and two more bedrooms with a bathroom. All the beds are king sized. On the top floor you will find two more bedrooms with two en-suite bathrooms, one of which has a stand-up shower. Everything you could possibly need is catered for. 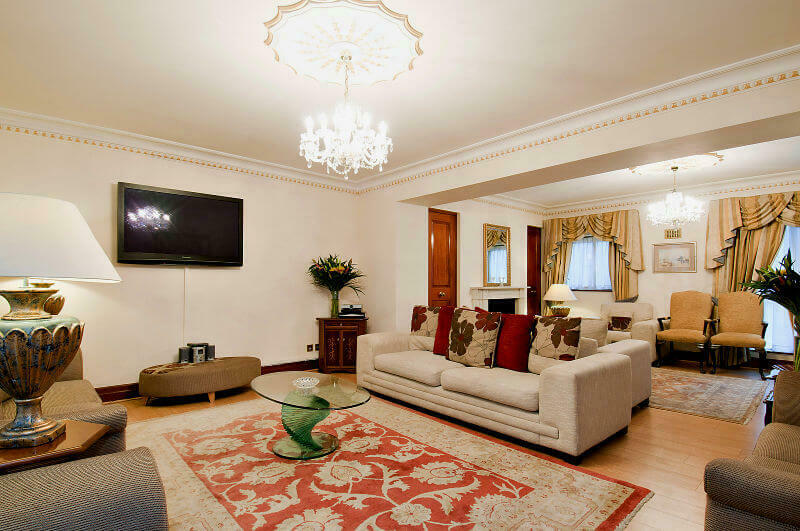 There is high speed broadband throughout the house, and the latest TV’s in every room with around 2,000 Sky channels in English, Russian, Arabic, Hindu, and many more languages. A private parking space can be provided by arrangement. 24 hour concierge service and security is provided by our staff in Carlton Court just around the corner.